Once you arrive and explore the resort, you will discover the unique features, comforts, and amenities provided to each of our guests. 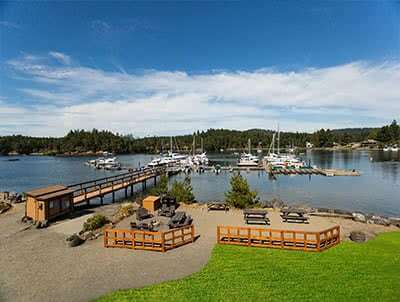 Located on San Juan Island’s west side, on peaceful Mitchell Bay, Snug Harbor Resort offers year-round waterfront accommodations. All of our 17 cabins and three suites are spacious with beautiful interiors, expansive glass, vaulted ceilings, full kitchens, and uninterrupted, stunning views. 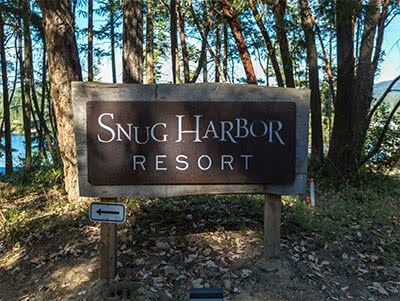 Snug Harbor’s incredible setting is unparalleled on San Juan Island. Arriving by boat is always an option, since we have our own private marina. We are perfectly located for adventures throughout the islands. Once you arrive and explore the resort, you will discover the unique features, comforts, and amenities provided to each of our guests. We strive to make each guest’s visit amazing and memorable. We offer two paddle boards, kayaks, canoes and bikes for the complimentary use by our guests. Our own Mitchell Bay Coffee is open daily offering an array of coffee beverages, local pastries, waffles, soups, and more. And if you are looking for somewhere to host an event, the new events room with seating for up to 50 is now available. When you come to Snug Harbor be ready to detach a little. This is an ideal place to unwind and relax (while we have free wi-fi throughout the property and great cell phone reception, there are no phones in the cabins). Allow the peace and serenity on Mitchell Bay overtake you. We believe our guests have said it best. 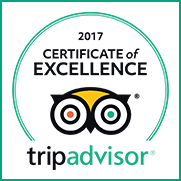 One recent Trip Advisor review stated "This place is truly paradise" and our favorite Facebook post simply stated "The cabins are epic". The location of this resort is amazing ! We found it peaceful, calm, and clean with beautiful views. It is only a few minutes from the busy harbor as well as many areas to hike. It was truly hard to leave our cabin when we had to check out! This resort made our visit to the San Juan Island even more special ! We would definitely recommend this resort. I stayed at Snug Harbor Resort for a girls weekend and it was perfect. Beautiful, clean cabin. Nice picnic bench for us outside the cabin, covered, and with a view of the water. We also used the kayaks the resort had for guests, which were in great shape. I'd definitely recommend staying here. 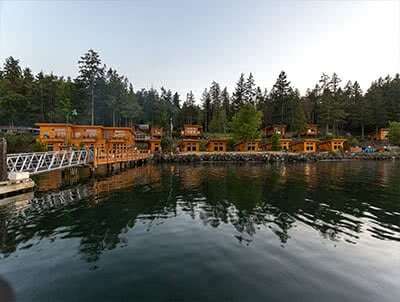 The snug harbour resort is the most serene way to visit the SAN Juan islands. We found ourselves drawn to sitting on the deck of room 20 having a bbq and captivated by the serene surroundings. The staff were so positive and enhanced the experience. The highlights of the trip was watching the orcas and their the “Maya’s Legacy” boat leaves from this marina. We went on the sunset cruise and had the time of our lives. The resort had cooking facilities, but we loved their commitment to sustaining the environment and loved their unique shower. This was a complete experience. The only thing we would have done different was to stay here longer. Our family loved this spot and wished we had booked an additional day. The staff was so friendly and went out of their way to help out and make our kids feel welcome. We enjoyed exploring the docks, going out on the boats, making s’mores every night at the fire pits and enjoying grilling meals out on the decks. We had three families and were able to have a couple cabins next to each other. The views are all great and it was so peaceful just watching the boats come and go. We recently stayed 3 nights at this waterfront resort- wished it had been longer. We walked into the cabin and immediately fell in love with the view. The kitchen was compact but had everything that we needed. My son said the pull out couch was ok. The shower had an outdoor feel (a good thing). The property had paddle boards, kayaks, canoes, bocce balls and fire pits for use. You could also borrow games and movies from the office. It is a little remote, so helpful if you have a car. Caution- internet very spotty and no a/c. Neither one of these issues really bothered us, although our teenager may disagree. Would absolutely recommend and would love to return. 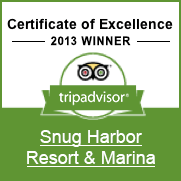 1-10 rating--Snug Harbor Resort is a 15! FANTASTIC! Perfect escape for those who want to recoonect with family, friends or your spouse. We had a 2 bedroom cabin which was perfect for 4 adults. Everything in the cabin was very clean and well appointed. We loved the warmth of the gas fireplace was absolutely wonderful since it was quite chilly outside. We liked the location; it was amazingly quiet and peaceful. This is a place of serenity and peace. Every detail is has been given great attention. The staff were delightful and the place sparkled. Thank you for such a great experience and for such a well done "cabin" I mean these were nice! Discover Nature at its Finest A PREFERRED LOCATION OF OUTDOOR ENTHUSIASTS. From our spacious cabins and private marina, to the 5 acres and 650' of shoreline, we want you to feel this is your private sanctuary. Because of our West side location, amazing sunsets are a regular occurrence.